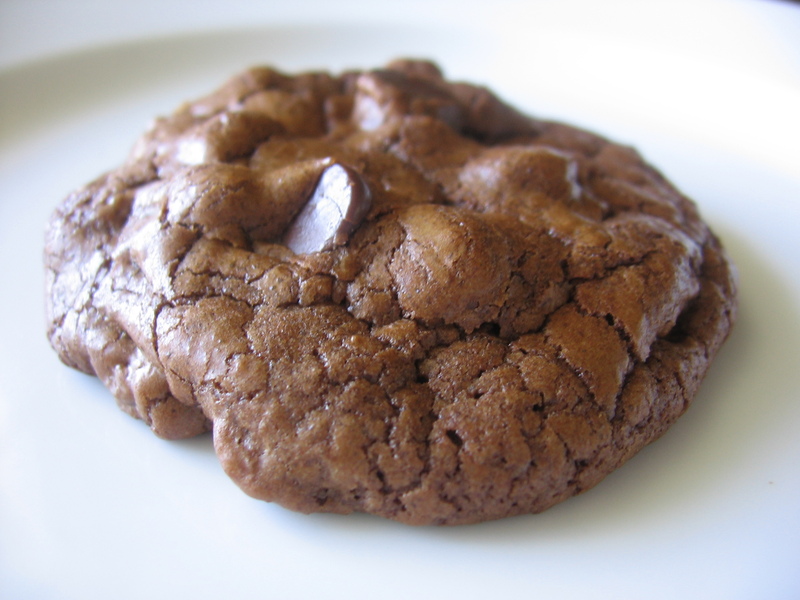 I am a firm believer that in order to have a trully ‘Chocolate’ cookie it should include melted chocolate in the dough and not just cocoa powder (a combination of both is also accepted). 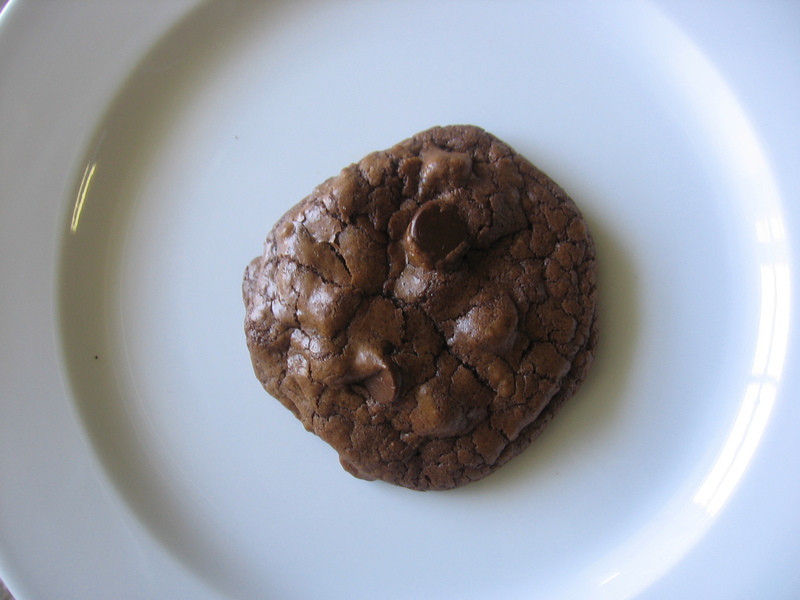 While I love cookies and chocolate, I am not a huge fan of Chocolate Cookies (gasp! I know). I do however enjoy Chocolate cookies with a bowl of good old vanilla icecream. MMM good. I found this recipe on a piece of paper taped to the back cover of an old church cookbook I bought at a yard sale last weekend. The paper was splattered with chocolate batter and had grease spots from melted butter. I knew these had to be yummy as the worn recipe was a sign that these were made often. I was sold (plus, I have a soft spot for old hand written recipes, blogs and the internet depersonalize (word???) so many family treasured recipes that whenever I find an old hand-written one, my heart jumps a bit. I feel like a highschool girl getting ready for her first date unsure of how it will turn out. Wishing for the best but preparing for the worst. Knowing that either way, it will be an experience none the less). I made these to take to a work picnic and they were very well received. The recipe underlines “Do not overbake” so I erred on the side of caution. The texture of these cookies were great! Once set they had chewey (not cakey) interiors with slightly crisp edges. The taste is not as tooth-acheingly sweet as I would have thought. I think the bittersweet chocolate mellows out the sweetness a nd provides a rich chocolate flavor. The milk chocolate chips I used balanced out the semisweet and bittersweet batter perfectly, though I am sure semisweet or dark chocolate would be equally as good. Next time I make these I may add 1/2 tsp espresso powder to deeped the chocolate flavor more and maybe add some walnuts. As is they are very good, adults and kids both said how great they were. Four people asked for the recipe, so that is always a sign of a good recipe. I am not sure I would make these again unless I was taking them for others to enjoy. Like I said, I am not a huge fan of chocolate cookies. That did not stop me however, from enjoying four of these (not at the same time) with scoops of vanilla icecream. In a microwave save bowl combine the chopped chocolate and butter. Heat in microwave stirring every 20 seconds. Heat until almost melted, stirring until smooth and melted. Do NOT overheat chocolate mixture. In a large mixing bowl, beat eggs, brown sugar, and vanilla on high speed until light and fluffy (about 2-4 minutes). Reduce speed to low and slowly add the melted chocolate mixture. Beat to combine. Add the flour mixture until and mix until just combined. Allow dough to firm up for 10 minutes before baking. Drop dough by tablespoons onto prepared baking sheet. Bake 10-13 minutes or until tops are shiny, center is soft but edges are set. Do NOT overbake. Allow to cool on sheet for 5 minutes before transfering to rack to cool compleletly. This entry was posted in Chocolate, Chocolate Chip Cookies, Chocolate Cookies, Rated an 8.5 by bakingblonde. Bookmark the permalink. Hmmm I’ve never added melted chocolate to a cookie batter. Maybe it would make me like them better? I so look forward to when you post a new recipe you’ve tried. I’ve made two or three of your recipes (easy and so yummy! )and still I have a more to go. What an awesome recipe to find! It looks wonderfully chocolately and rich… just like I like them. I love the name of these cookies…too funny! They do look intensely chocolately! Funny how you found the recipe! They look like chocolate heaven! I LOOOOOOOOOOVE the name of this recipe! Sounds PERFECT for my chocolate-loving husband. STARRED to make! Thanks!! I made a recipe pretty much just like this over the weekend, and LOVED them! I love how you found this recipe! It makes baking sound so romantic with the found old recipe and delicious result! These look so good! I could just eat the first picture up. I love that these are from an old “loved” recipe. They look fantastic! Your photos are scrumptious, but I have a couple questions before I try your recipe! Is the amount of flour in this recipe correct? Only 2/3 cup of all-purpose flour… Also, the directions say to “Allow dough to firm up for 10 minutes before baking” — is that do to the low amount of flour? and did you let it rest on the counter or chill in the refrig? Lastly, about how many cookies did the recipe yield? 1. the amount of flour is correct, I did use the scoop and level (as opposed to the spooning into the cup) method. 2. The resting time is to allow for the melted chocolate to firm up a bit to help the dough hold their shape. Because the chocolate being added is in liquid and not powder form, the dough will be thinner than usual dough at first but will firm up with a short rest. I popped mine in the fridge for 10 minutes. 3. I got about 24 cookies out of my batch of dough. Hope they turn out for you! I am a chocolate gal! These look like a dream! What an awesome find! I love old hand-written recipes too. They look really chocolatey and good! These look sooooo yummy! The best wedding gift that my cousins and I got was a recipe box of handwritten family recipes that had been passed down over the years. There were ones from my grandmother, great grandmother, aunts and great aunts. In my box, my mom included ones that she got from my mother in law and her aunt. She’d copied them and laminated them to protect them all. It was a great gift and will be passed on to my daughter. Such restraint – I’d have had four at a go 😉 I love chocolate so these are just about perfect from over here. Church cookbooks are the best! They’ve always got the best recipes! Oh gosh. I love cookies. These look amazing! I would make them, but I already have about 4 dozen cookies laying around. Anyway, these look PERFECT. I love your blog! I love this post. I remember being a kid and cooking from my Mom’s Betty Crocker cookbook, and almost every page had a stain or some dried ingredient on it from all the use it received. Would you mind if I baked these and featured them on my blog? I’d certainly link back to you for credit. I’m going to have to try these. Just for fun, I might add chipotles and pretzel bits and see if they taste like Alexandra’s Cookie Dream “New York Cowgirl” pretzels. Thanks again for the recipe. I just baked up a few more for myself. The pretzels, chipotle and espresso worked beautifully, however, I need a second opinion on the level of chocolate. I used all 72% cacao and the cookies are intensely chocolate. About the chipotle, it doesn’t taste weird or anything and you really don’t detect the smoky flavor of chipotle. All your really get from the chipotle is a little burn at the end. I’m a blonde who bakes, too! And I agree, melted chocolate is the way to go when you make chocolate cookies. However, I just got some high quality cocoa powder, so I would be willing to try that in a cookie recipe. These, though, I can’t wait to test out on my coworkers. With a name like that, how can one resist??? I made these and they were quite a hit. Just did a post in honor of your blog featuring these and your butterscotch rice krispies cookies, thanks for such awesome recipes.